In the past five years, fruit and vegetable intake among Americans has fallen – especially in regard to older individuals. A 2015 survey conducted by the Produce for Better Health Foundation discovered a 7 percent per capita decline, but for people 45 and older, the drop is even more significant. 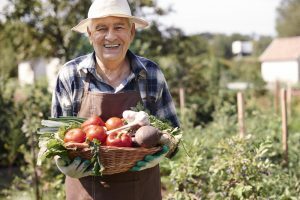 Even though adults 65 and older tend to be the highest consumers of fruits and vegetables, some senior adults may not understand the importance of eating these vibrant and healthful foods. As senior caregivers, we understand how essential fruits and veggies are, but we also understand how easy it can be to avoid them in favor of pre-packed snacks and fast food. If you want to add a little more color to your diet, here’s how to eat more fruits and vegetables and actually like them! Foods for vitamins: If you take a pill for vitamin A and C to help your immunity, bone development and eye health, try sourcing these nutrients through food instead. By ditching the pill, you’ll be obligated to eat more colorful vegetables such as carrots, sweet potatoes, pumpkin, and red peppers. Leafy greens such as spinach, collards and turnip greens are a great source of vitamin A and C, while sweet fruits like kiwi, strawberries and cantaloupe can help your body get the vitamin C it deserves. Put your fruit on display: If you see colorful fruits, you’re more likely to actually eat them. Take some time to create a center piece for your kitchen table and fill it with decorative offerings like apples, oranges, bananas, grapefruit, cantaloupe and kiwi. After you eat the fruits, you’ll be inclined to buy more so that your new decoration always looks full and inviting. Challenge yourself: Because everyone likes a victory, set a personal challenge to help keep your fruit and veggie intake up. Whether it’s mastering a new recipe with fruits and vegetables, hitting a daily quota, or trying new foods, putting a goal for a number of fruits and vegetables to eat a day will help keep you motivated to improve your diet and your health. As we age, staying healthy means being mindful of what we eat. By encouraging yourself and your loved ones to consume more fruits and vegetables, you’re encouraging a better way of life. To learn more about FirstLight Home Care, our culture of care and how we work to assist seniors in all aspects of life, please read more about “Why FirstLight” today.